The 489 visa is a provisional visa that allows the applicant to love and work in Australia for a period of 4 years. The place of work and the place of residency in Australia under the 489 visa should be a regional area. The basic qualification for the visa is a relative living in a designated are willing to sponsor or the state or territory government. 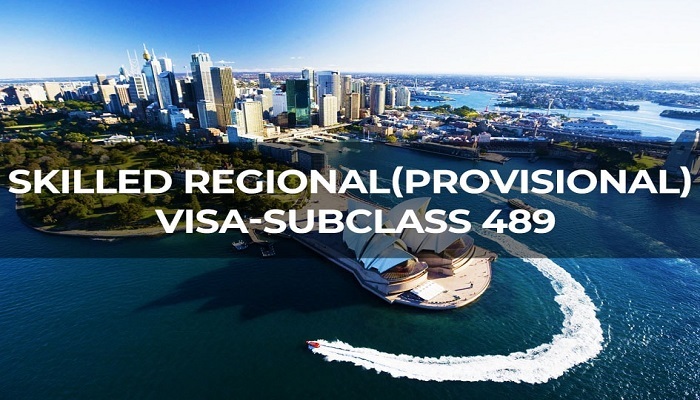 To initiate the application for the Australia skilled nominated visa subclass- 489, the applicant needs to register an Expression of Interest through the SkillSelect program. On registration, the applicant will be invited by the Department of Immigration for further application. On receiving the invitation, the applicant must apply within 60 days with all supporting documents required. The 489 visa requires sponsorship from the state or territory government in Australia. The state or territory nominates applicants based on their skill set and the requirements at their end. The requirement of each state or territory may differ and thus the skill set required may differ. Based on the requirements, some state or territory may ask for higher English scores, other may ask for a specific work experience and skill set.Once a state sponsorship is received, the applicant must live and work in a regional area of the sponsoring state. The applicant must live and work outside the metropolitan area. An eligible relative living in a designated area can sponsor the applicant for family sponsored visa Australia 489. The sponsoring relative must be a permanent resident of Australia, a citizen of Australia or an eligible citizen of New Zealand. To accept the sponsorship from a relative the applicant must be nominated for an occupation that is included in the Medium and Long-term Strategic Skills List.The sponsor should be living outside the metropolitan area. Once the nomination and relative sponsorship is approved, the applicant must live in the same designated area as the relative. The applicant must hold a subclass 475, 487, 495 or 496 visa. The applicant must be nominated by a state, a territory or sponsored by an eligible relative. The applicant must receive an application to apply for the visa. The applicant must be skilled for the relevant occupation and job position. The applicant should score teat marks of 60 points or more. The applicant should be less than 45 years of age. The applicant should be fluent in English. The 489 visa can be applied for with sponsorship from a state or a territory of Australia or from an eligible relative living in a designated area. The applicant satisfying the eligibility criteria can live and work in regional areas of Australia for duration of 4 years. This provisional visa provides a pathway to permanent residency after the span of 2 years of living and working in a designated area. Why Immigrate to British Columbia? Visa Services Australia skilled nominated visa subclass- 489. permalink.